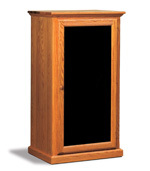 Provide royal style and protection for your high end electronic equipment in a wooden audio cabinet. With four adjustable shelves in the Classic Stereo Cabinet, you will have no trouble fitting your unique system to this solid wood cabinet. Ultra clean lines and a smoked glass door will give you room and entertainment system a high tech, sleek look and feel. Get the exact color and wood grain you're looking for by selecting from four wood types and dozens of stain types. Ask about our optional automated cooling fan systems that can be installed into the back our stereo cabinets. Use our drop down boxes at the top right of the page to select options your Amish stereo cabinet. The distinct features of the Hoosier Heritage Stereo Cabinet will greatly improve the looks and feel of your entertainment room and stereo system. One door and two drawers will help you organize your media and entertainment accessories with style. We can build this piece so it's uniquely yours from four wood types and many stain colors. Ask about our optional cooling fan installation systems that can be installed on our stereo cabinets. Give your high tech electronic system a worthy resting place with the Mission 0SC 26" Stereo Cabinet. The blend of 100% hardwood and high tech is the essence of elegance and sophistication of our day. Comes standard with pictured hardware, but more hardware options available. See drop down box to add reverse panel sides and corbels (pictured). Add the classic, elegant, and timeless style of the Mission look to your entertainment system with the Mission Stereo Cabinet. The handy one door two drawer configuration will make organization a breeze, while three adjustable shelves will make fitting your stereo console effortless. This unit can be finished in dozens of colors and wood grains. Ask about our optional automated cooling fan systems that can be installed into the back our stereo cabinets. Enhance the looks and style of your entertainment system and room with the Mission Stereo Cabinet. This stereo cabinet is elegantly styled with the straight edges and square angles the Mission style is famous for. Four adjustable shelves will make you life easy when installing your stereo system or organizing your media and other accessories. The Mission Stereo Cabinet can be built from four popular, select grade hardwoods that can then be finished in several stain colors so you can get the look you want. Ask about our optional automated cooling fan systems that can be installed into the back our stereo cabinets. The Old Classic Sleigh Stereo Cabinet has an unforgettable character that will bring charm and delight to your special room. You will look at your entertainment system in an entirely different way when housed in this stereo cabinet. One door and two doors grant you access to three adjustable shelves and plenty of space for organizing your media and entertainment accessories. Ask about our optional automated cooling fan systems that can be installed into the back our stereo cabinets. The graceful and rolling curves of the Old Classic Sleigh style gives to a stereo cabinet what it's always been looking for. The mix of old world style and high tech sleekness provides a feel to your room unmatched by very few. The Old Classic Sleigh Stereo Cabinet comes with 5 adjustable shelves to make fitting your equipment easy, and organizing your media and accessories a breeze. Choose from dozens of stain colors to be applied on your choose of four or more select grade hardwoods. Ask about our optional automated cooling fan systems that can be installed into the back our stereo cabinets.